Caramel is very much the go to flavour of the British public. It is an easy win, sugary with nothing offensive about it. 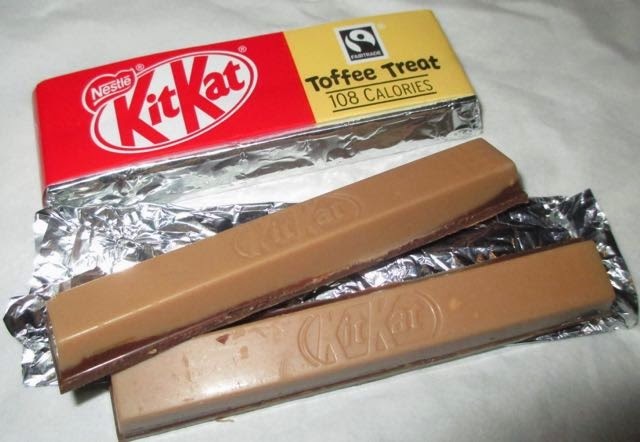 I think Kit Kat have, over the years, cashed in on this idea, with caramel flavoured flat Kit Kats available in multi packs, caramel flavour Kit Kit Chunkies, Caramel Kit Kat Senses, Caramac Kit Kat and most recently a Kit Kat with two different types of Caramel within it. I can imagine clearly then the recent meeting that must have taken place at Kit Kat UK head quarters where they must have spent several hours trying to think of a new format for another caramel bar, and realised they really had done caramel to death. I suspect someone at the back shouted “how about toffee, its like caramel but very slightly different” and he or she was probably lifted on the their colleagues shoulders during the applause and got a promotion. I jest but if you’ve seen the bucket loads of flavoured Kit Kats available across the world, (Japan in particular) you’d understand my frustration. Anyway back to the latest new UK Kit Kat, Toffee Treat. It is the traditional twin sized Kit Kat available in fingers in multi packs. I like unwrapping these Kit Kats as they feel very retro with their paper wrapper covering the tin foil. I was quite pleased to see the chocolate was at least properly different and the coating was three quarters covered in a paler chocolate toffee concoction. It smelt lovely when the wrapper was off. The flavour was all in the coating, the Kit Kat looked normal inside. I have to admit I enjoyed it, the toffee flavour was nice, not too strong and had a soothing brown sugary taste. The chocolate was still prominent and the Kit Kat was an easy to like bar, not exciting you understand but undeniably tasty. I’m not sure we are going to see the crazy flavours that are available abroad, so I guess I’m stuck with import shops for them. As an attempt to help out the product development team at Kit Kat HQ I had an idea, email me if you want to sort out royalties Nestle but how about… Kit Kat Butterscotch edition, that sounds right up your street. I got a 4-finger bar of this in Sainsburys (it's not in the retro foil packaging though). It tastes just like a Caramac Kit-Kat to me. Overly sweet. Yes, now you mention it, it is very much like the Caramac one used to be.